With edge lengths of 3.5 metres and a weight of 95 tons each, the mould clamping platens of the ENGEL duo 80000H/80000H/5500 injection moulding machine which Sulo Umwelttechnik uses to make four-wheel rubbish containers are the biggest and heaviest ENGEL has ever built. The model has set another record too: There is no other machine of this size on the market which achieves comparable energy efficiency. 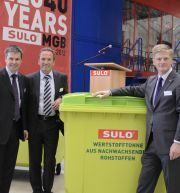 Sulo Umwelttechnik is among the world’s leading suppliers of high-quality rubbish and recycling collection containers. 40 years ago, the company launched the first plastic four-wheel rubbish containers onto the market. The vast majority of steel containers have now been replaced by plastic successors. By investing in this new large-scale machine, Sulo has increased the capacity at its Herford site and is now able to produce four-wheel containers with capacities of 660, 770, and 1100 litres. The largest rubbish containers are 1200mm x 1000mm x 1000mm. The space between the large machine’s tie bars is 2580mm in width and 2800mm in height, and therefore allows its mould, which weighs 112 tons, to be inserted and removed without any problems. Two barrier screws with a diameter of 215mm and a length/diameter ratio of 24:1 feed in the material (HDPE), while the narrow design of the injection units means the nozzles can be 2050mm apart. The injection pressure is 2100 bar. As a pioneer in the particularly dynamic waste disposal sector, Sulo also has its own measures in place to ensure that maximum sustainability is always achieved. The energy efficiency of its injection moulding machines plays a major role here, which is why, as the world’s first IMM of this size, its new ENGEL duo has been fitted with the ENGEL servo-hydraulic system, ecodrive. “No drive when idle” is the key to ENGEL drastically reducing the energy consumption levels of its hydraulic machines. During cooling phases for example, the idling and flushing energy consumed by conventional hydraulic systems is saved completely. This lowers Sulo’s annual electricity consumption by more than a million kWh, the equivalent to the annual consumption of 220 four-person households. Sulo’s record order was not just a special challenge for ENGEL because of the huge mould clamping platens: as XXL class machines are actually planned around the mould or the product to be manufactured. Although the ENGEL business unit Packaging (in conjunction with ENGEL Hanover and the ENGEL large-scale machine factory in St. Valentin, Austria, in this case) is able to provide long-term machine stability as well as extremely high quality and availability from a wealth of tested option packages for this, every new XXL machine is individualised and made to measure. Ultimately, the close cooperation between Sulo, ENGEL Packaging, ENGEL Hanover, and St, Valentin also made a crucial contribution to enabling the project to be completed successfully within a relatively short period of time.